The Senior Bowl week produced a few surprises and one of those was the Miami wide out Phillip Dorsett. Pardon my Mainerism with the title of this article. He definitely caught my attention in Mobile and rose in my receiver ranks because of his wiggle, burst, and catch radius. Just to make sure what I saw in practice translated to the gridiron, I watched five games against Arkansas State, Cincinnati, Georgia Tech, Nebraska, and Florida State. Now, I like him a bit more. 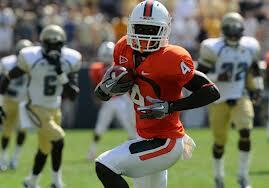 WR Phillip Dorsett, Miami (FL) 5’ 10” 185 lbs. Cons: The receiver has a slight build,is not the cleanest route runner, and doesn’t always catch the ball cleanly with his hands. He suffered a partial torn MCL in 2013 which slows him down a little. His college production is also not that impressive with 36 catches in his senior year (58 receptions his sophomore year for a college career high), on the bright side, Dorsett did manage to take ten of those receptions to the house this past season. Pros (receiving): Dorsett, whether lined up outside or in the slot, explodes off the line of scrimmage with quick feet and fluid movement creating almost immediate separation. He tracks the ball well in the air, adjusts to the pigskin by contorting his body, and attacks the ball at its highest point. His ability to run underneath bombs with his suddenness makes him a scary guy to defend. It’s those double and triple moves that make him more difficult to track than most receivers. The wide out uses great footwork and can change directions effortlessly, making him hard to bring down in the open field playing more like a running back than a receiver. When Dorsett gets targeted on bubble screens, he can make the first defender miss, teleporting down the field while hugging the sidelines on the way to pay dirt. Keep in mind, this wide out is not just a speed receiver. He makes catches in tight coverage, shielding the ball from defensive backs, and shows good concentration in the middle of the field. Dorsett has good sideline awareness making sure he gets both feet in bounds when bringing in the ball. The wide out high steps away from ankle tackles and always keeps moving forward. Pros (special teams/run game): He is a good kickoff and punt returner by seeing the entire field well, forcing defenders into taking difficult angles. Dorsett follows his blockers and can turn on the afterburners to streak down the field. The playmaker might be the fastest man in the 2015 class. He is a willing blocker in both the run and passing game working down the field. The receiver shows good balance and can seal off a lane in the run game. Anytime he touches the ball, he has the wiggle and acceleration to score. Overall thoughts: This receiver has Steelers Antonio Brown upside (could become a WR1 with a great combination of speed, route running, and hands). On the other hand, he might only become a solid football player like the Jets Jeremy Kerley who is more of a returner who plays some in the slot. After Amari Cooper, DeVante Parker, Kevin White, and Jaelen Strong, you could do much worse than selecting Phillip Dorsett in your rookie draft. If you enjoy the website, consider donating using the PayPal button at the bottom of the page. Follow me on Twitter @AndrewMiley or the site @Dynasty_Blitz. « David Cobb: Is One Gear Enough?